Samsung General Chemicals Co., Ltd.
2001-11-09 Application filed by Samsung General Chemicals Co., Ltd. filed Critical Samsung General Chemicals Co., Ltd. The present invention provides a method for producing a new catalyst of high catalytic activity and superior catalyst morphology for homo- or co-polymerization of ethylene, or more particularly a method for producing a titanium solid complex catalyst supported on a carrier containing magnesium, wherein said catalyst of high polymerization activity is capable of producing polymers of high bulk density. Technical Field The present invention provides a method for producing a catalyst for homo- or co- polymerization of ethylene, or more particularly a method for producing a titanium solid complex catalyst supported on a carrier containing magnesium, wherein said catalyst has a very high catalytic activity and superior catalyst morphology. Catalysts containing magnesium for polymerization or co-polymerization of ethylene are known to have very high catalytic activities and to accord polymers of high bulk density, which are suitable for liquid phase or gas phase polymerization. By liquid phase polymerization of ethylene, it denotes a polymerization process performed in a medium such as bulk ethylene, isopentane, or hexane, and as for the important characteristics of catalysts used therein, in consideration of the applicability to the process, there are as follows: high catalytic activity, bulk density of the resultant polymers, and the content of low molecular weight molecules of the resultant polymers soluble in a medium. Among these, the catalytic activity is deemed to be the most important characteristic of a catalyst. Many of the titanium-based catalysts containing magnesium for olefin polymerization, and the manufacturing methods thereof have been reported. Especially, many processes making use of magnesium solutions to obtain catalysts which can generate olefin polymers of high bulk apparent density have been known. There is a means of obtaining a magnesium solution by reacting magnesium compounds with such electron donors as alcohol, amine, cyclic ether, or organic carboxylic acid in the presence of a hydrocarbon solvent. As for the cases of use of alcohol, they are disclosed in US Patent Nos. 4,330,649, and 5,106,807. Further, the methods for production of catalysts containing magnesium by reacting said liquid- phase magnesium solution with a halogenated compound such as titanium tetrachloride are well known. Such catalysts provide high bulk density to the resultant polymers, but there is much yet to be improved with respect to their catalytic activities, and there are production disadvantages, such as its production of a large amount of hydrogen chloride during the production of catalysts. US Patent No. 5,459,116 reported a method of production of a titanium solid catalyst by contact-reacting a magnesium solution containing an ester having at least one hydroxy group as an electron donor with a titanium compound. By this method, it is possible to obtain a catalyst of high polymerization activity, which accords high bulk density to resultant polymers, but there is room for yet more improvements. US Patent No. 4,843,049 reported a method for producing a catalyst of high titanium content by reacting titanium alkoxide with a magnesium chloride-ethanol carrier produced by means of a spray-drying method, and then reacting thereto delhylaluminium chloride or ethylaluminium sequischloήde. However, there are disadvantages in that the method results in alcohol content which is outside the range of 18-25%, or deterioration of bulk density of polymers thus produced when compounds other than diethylaluminium chloride or ethylaluminium sesquichloήde are used. US Patent Nos. 5,726,261 and 5,585,317 disclose a method for producing a catalyst having porosity of 0.35 ~ 0.7 by heat treating a magnesium chloride-ethanol carrier produced by means of a spray-drying method, or by heat treating the same, followed by treatment with triemylaluminium, and then treating thereto a titanium alkoxide, or titanium alkoxide along with silicone tetraethoxide, etc., by which a titanium-based compound having at least one titanium-halogen and at least one alkoxy group is then supported . Consequently, the objective of the present invention is to provide a new method for producing a catalyst for homo- or co-polymerization of ethylene, wherein said catalyst has enhanced catalytic activity, which is capable of producing polymers of high bulk density. Still other objectives and the utility of the present invention will become apparent as references are made with respect to the following descriptions and the claims thereto. The catalyst for homo-polymerization or co-polymerization of ethylene according to the present invention is produced by a simple yet efficient manufacturing process, which comprises (i) preparing a magnesium solution by contact-reacting a halogenated magnesium compound with alcohol; (if) producing a solid component of controlled particles morphology by reacting said solution with an ester compound containing at least one hydroxy group and a silicone compound containing an alkoxy group, and then adding thereto a mixture of a titanium compound and a silicon compound; and (ϋi) reacting thereto an aluminium compound, a haloalkane compound, either in conjunction or in sequence, and then reacting thereto a titanium compound. Types of halogenated magnesium compounds used in the present invention are as follows: di-halogenated magnesiums such as magnesium chloride, magnesium iodide, magnesium fluoride, and magnesium bromide; alkymagnesium halides such as methylmagnesium halide, ethylmagnesium halide, propylmagnesium halide, butylmagnesium halide, isobutylmagnesium halide, hexylmagnesium halide, and amylmagnesium halide; alkoxymagnesium halides such as methoxymagnesium halide, ethoxymagensium halide, isopropoxymagnesium halide, butoxymagnesium halide, octoxymagnesium halide; and aryloxymagnesium halides such as phenoxymagnesium halide and methyl-phenoxymagnesium halide. Of the above magnesium compounds, two or more compounds can be used in a mixture. Further, the above magnesium compounds can be effectively used in the form of a complex compound with other metals. Of the compounds listed above, some can be represented by a simple formula, but the others cannot be so represented depending on the production methods of magnesium compounds. In the latter cases, it can be generally regarded as a mixture of some of the listed compounds. For example, the following compounds can be used in the present invention: such compounds obtained by reacting magnesium compounds with polysilolxane compounds, silane compounds containing halogen, ester, or alcohol; and such compounds obtained by reacting magnesium metals with alcohol, phenol, or ether in the presence of halosilane, phosphorus pentachloride, or thionyl chloride. However, the preferable magnesium compounds are magnesium halides, especially magnesium chloride or alkylmagnesium chloride, preferably those having respectively an alkyl group of 1~ 10 carbons; alkoxymagnesium chlorides, preferably those having respectively 1 - 10 carbons; and aryloxymagnesium chlorides, preferably those having respectively 6 - 20 carbons. The magnesium solution used in the present invention can be produced as solution by using the aforementioned magnesium compounds in the presence a hydrocarbon solvent, or in the absence thereof in an alcohol solvent. As to the types of hydrocarbon solvents used in the present invention, they include aliphatic hydrocarbons such as pentane, hexane, heptane, octane, decane, and kerosene; alicyclic hydrocarbons such as cyclobenzene, methylcyclobenzene, cyclohexane, and methylcyclohexane; aromatic hydrocarbons such as benzene, toluene, xylene, ethylbenzene, cumene, and cymene; and halogenated hydrocarbons such as dichloroprppane, dichloroethylene, trichloroethylene, carbon tetrachloride, and chlorobenzene. When a magnesium compound is converted into a magnesium solution, alcohol is used in the presence of the aforementioned hydrocarbons. The types of alcohol include those containing 1 - 20 carbon atoms, such as methanol, ethanol, propanol, butanol, pentanol, hexanol, octanol, decanol, dodecanol, octadecyl alcohol, benzyl alcohol, phenylethyl alcohol, isopropyl benzyl alcohol, and cumyl-alcohol, although alcohol containing 1 - 12 carbon atoms is preferable. The average size of a target catalyst and its particle distribution can vary according to the types of alcohol, the total contents, the types of magnesium compounds, and the ratio of magnesium to alcohol, etc. Nevertheless, the total amount of alcohol required to obtain the magnesium solution is at least 0.5 mol per each mole of magnesium compounds, preferably about 1.0 ~ 20 mol, or more preferably about 2.0 - 10 mol. During the production of magnesium solution, the reaction of a magnesium compound with alcohol is preferably carried out in the presence of a hydrocarbon medium. The reaction temperature, while variable depending on the types and the amount of alcohol, is at least about -25°C, preferably -10 - 200°C, or more preferably about 0 - 150°C. It is preferable to carry out the reaction for about 15 minutes - 5 hours, preferably for about 30 minutes - 4 hours. Of the electron donors used in the present invention, the ester compounds respectively containing at least one hydroxy group include unsaturated aliphatic acid esters respectively having at least one hydroxy group, such as 2-hydroxy ethylacrylate, 2-hydroxy ethylmethacrylate, 2-hydroxypropyl acrylate, 2-hydroxypropylmethacrylate, 4-hydroxy butylacrylate, pentaerythritol triacrylate; aliphatic monoesters or polyesters respectively containing at least one hydroxy group, such as 2-hydroxy ethyl acetate, methyl 3-hydroxy butylate, ethyl 3-hydroxy butylate, methyl 2-hydroxy isobutylate, ethyl 2-hydroxy isobutylate, methyl-3-hydroxy-2-methyl propionate, 2,2-dimethyl-3-hydroxy propionate, ethyl-6-hydroxy hexanoate, t-butyl-2-hydroxy isobutylate, diethyl-3-hydroxy glutarate, ethyl lactate, isopropyl lactate, butyl isobutyl lactate, isobutyl lactate, ethyl mandelate, dimethyl ethyl tartrate, ethyl tartrate, dibutyl tartrate, diethyl citrate, tiiethyl citrate, ethyl-2-hydroxy-caproate, diethyl bis- (hydroxy methyl) malonate; aromatic esters respectively having at least one hydroxy group, such as 2-hydroxy ethyl benzoate, 2-hydroxy ethyl salicylate, methyl-4-(hydroxy methyl) benzoate, methyl 4-hydroxy benzoate, ethyl 3-hydroxy benzoate, 4-methyl salicylate, ethyl salicylate, phenyl salicylate, propyl 4-hydroxy benzoate, phenyl 3-hydroxy naphthanoate, monoethylene glycol monobenzoate, diethylene glycol monobenzoate, tiiethylene glycol monobenzoate; alicyclic esters respectively having at least one hydroxy group, such as hydroxybutyl lactone, and others. The amount of the ester compound containing at least one hydroxy group should be 0.001 - 5 mol per mole of magnesium, or preferably 0.01 - 2 mol per mole of magnesium. For the silicon compound containing an alkoxy group, which can be used as another electron donor in the present invention, a compound which is represented by a general formula of RnSi(OR)4.n (here R is a hydrocarbon having 1-12 carbons, while "n" is a natural number from 0 to 3) is preferable. In particular, the following compounds can be used: dimethyldimethoxysilane, dimethyldiethoxysilane, diphenyldimethoxysilane, methylphenylmethoxysilane, diphenyldiethoxysilane, ethyltrimethoxysilane, vinyltrimethoxysilane, methyltrimethoxysilane, phenyltrimethoxysilane, methyltriethoxysilane, ethyltriethoxysilane, vinyltriethoxysilane, butyltriethoxysilane, phenyltriethoxysilane, ethyltriisopropoxysilane, vinyltributoxysilane, ethylsilicate, butylsilicate, methyltriaryloxysilane, etc. The amount of said compound is preferably 0.05~3mol per mole of magnesium, or more preferably 0.1 ~2mol. As for the temperature for the contact-reaction of the magnesium solution, an ester compound containing at least one hydroxy group, and an alkoxy silicone compound, the temperature of 0 - 100 °C is appropriate, or more preferably 10 - 70 °C. A mixture of the above titanium compounds can also be used in the present invention. However, the preferable titanium compounds are those containing respectively halogen, or more preferably titanium tetrachloride. The types of silicon compounds satisfying the above general formula of RnSiCl4.n include silicon tetrachloride; trichlorosilanes such as methyltrichlorosilane, ethyltrichlorosilane, phenyltrichlorosilane; dichlorosilanes such as dimethyldichlorosilane, diethyldichlorosilane, di- phenyldichlorosilane, and methylphenyldichlorosilane; monochlorosilanes such as trimethylchlorosilane; and a mixture of these silicon compounds can also be used in the present invention, or more preferably silicon tetrachloride can be used. The amount of mixture of a titanium compound and a silicon compound used during re- crystallization of magnesium compound solution is appropriately 0.1 - 200 mol per mole of magnesium compounds, preferably 0.1 - 100 mol, or more preferably 0.2 - 80 mol. The molar ratio of the titanium compound to the silicon compound in mixture is appropriately 1:0.05 - 0.95, or more preferably 1:0.1 - 0.8. When the magnesium compound solution is reacted with the mixture of a titanium compound and a silicon compound, the morphology and the sizes of the resultant re- crystallized solid constituents vary a great deal according to the reaction conditions. Hence, the reaction of the magnesium compound solution with the mixture of a titanium compound and a silicon compound should be carried out preferably at a sufficiently low temperature to result in formation of solid constituents. More preferably, the reaction should be carried out by contact-reaction at -70-70 ° C, or most preferably at -50-50 ° C. After the contact-reaction, the reacting temperature is slowly raised for sufficient reaction for the duration of 0.5 - 5 hours at50~ 150°C. To the solid component obtained above, an aluminium compound and a haloalkane compound are reacted thereto in conjunction or in sequence to activated the solid component. The examples of aluminium compounds include a trialkyl aluminium having an alkyl group of 1 - 6 carbons, such as triethylaluminium and trnsobutylaluminium; and an aluminium compound having one or more halogens, such as ethylaluminium dichloride, diethylaluminium chloride, ethyl-aluminium se&grø'chloride, or the mixture thereof. Moreover, the aluminium compound can be used after dilution if deemed necessary. A haloalkane compound is a compound having 1 - 20 carbon atoms and at least one halogen, and the mixture thereof can be used. The examples include monochloromethane, dichloromethane, trichloromethane, tetrachloromethane, monochloroethane, 1,2- dichloroethane, monochloropropane, monochlorobutane, monochloro-secondary-butane, monochloro-tertiary-butane, monochlorocyclohexane, chlorobenzene, monobromomethane, monobromopropane, monobromobutane, and monoiodomethane. When reacting an aluminium compound and a haloalkane, it should be carried out at 0 - 100°C, or more preferably at 20 ~ 80°C. To the solid component as activated above, the titanium compound is reacted thereto in the end to produce the solid catalyst. The titanium compound used at that time is a titanium halide or halogenated alkoxy titanium with an alkoxy functional group of 1 - 20 carbons. At times, a mixture of these compounds can also be used. Of these compounds, however, a titanium halide or a halogenated alkoxy titanium compound having an alkoxy functional group of 1-8 carbons can be appropriately used, or more preferably a titanium tetrahalide can be used. The catalyst produced according to the process of the present invention can be utilized for homo- or co-polymerization of ethylene. In particular, the catalyst is used in homo- polymerization of ethylene, and also in co-polymerization of ethylene and α-olefin such as propylene, 1-butene, 1-pentene, 4-methyl-l-pentene, or 1-hexene having three or more carbons. The polymerization reaction in the presence of a catalyst in the present invention is carried out by means of using a catalyst system comprising (i) a solid complex titanium catalyst of the present invention, comprising magnesium, titanium, halogen, and an electron donor, and (ϋ) organometallic compounds of Groups H or HI of the Periodic Table. In the present invention, the solid complex titanium catalyst constituent can be used as a component in the polymerization reaction after pre-polymerization with ethylene or α-olefin. The pre-polymerization can be carried out in the presence of a hydrocarbon solvent such as hexane, at a sufficiently low temperature, with ethylene or α-olefin under pressure, in the presence of the above catalyst constituent and such organic aluminium compound as triethylaluminium. The pre-polymerization, by maintaining the morphology of catalysts by surrounding the catalyst particles with polymers, is helpful in producing good-quality post- polymerization morphology of polymers. The weight ratio of polymers to catalysts after pre- polymerization is ordinarily 0.1 : 1 - 20: 1. The organometallic compound in the present invention can be represented by a general formula of MRn, wherein, M stands for a metal constituent of Group II or IHA in the Periodic Table, such as magnesium, calcium, zinc, boron, aluminium, and gallium, R for an alkyl group with 1 - 20 carbons, such as a methyl, ethyl, butyl, hexyl, octyl, or decyl group, and n for the atomic valence of the metal constituent. As for more preferable organometallic compounds, a trialkyl aluminium having an alkyl group of 1 - 6 carbons, such as triethylaluminium and tiiisobutylaluminium, or the mixture thereof can be utilized. On occasions, an organic aluminium compound having one or more halogen or hydride groups, such as ethylaluminium dichloride, diemylaluminium chloride, ethylaluminium sesquichloήde, or diisobulylaluminium hydride can also be used. As for the polymerization reaction, it is possible to carry out either the gas phase or bulk polymerization in the absence of an organic solvent, or the liquid slurry polymerization in the presence of an organic solvent. These polymerization methods, however, are carried out in the absence of oxygen, water, or other compounds that may act as catalytic poison. The concentration of the solid complex titanium catalyst (i) with respect to the polymerization reaction system, in case of liquid phase slurry polymerization, is approximately 0.001 - 5 mmol in terms of titanium atoms in catalyst per one liter of the solvent, or more preferably approximately 0.001 - 0.5 mmol. As for the solvent, the following compounds or the mixtures thereof can be used: alkanes such as pentane, hexane, heptane, n-octane, isooctane, cyclohexane, methylcyclohexane; alkylaromatics such as toluene, xylene, ethylbenzene, isopropylbenzene, ethyltoluene, n-propylbenzene, diethylbenzene; halogenated aromatics such as chlorobenzene, chloronaphthalene, ortho-dichlorobenzene; and the mixtures thereof. Hi the case of gas phase polymerization, the amount of the solid complex titanium catalyst (i) should be approximately 0.001 - 5 mmol in terms of titanium atoms in catalyst per one liter of the polymerization reactor, preferably approximately 0.001 - 1.0 mmol, or more preferably approximately 0.01 - 0.5 mmol. The preferable concentration of the organometallic compound (ii), as calculated by organometallic atom, is about 1 - 2,000 mol per mole of titanium atoms in catalyst (i), or more preferably about 5 - 500 mol. - 95 °C. The appropriate pressure of monomers at the time of polymerization is the atmospheric to 100 atm, or more preferably 2 - 50 atm. In the present invention, the changes in the molecular weight according to the amount of hydrogen consumption at the time of polymerization are shown as melt index (ASTM D 1238), which is generally known in the art. The value of the melt index generally becomes greater as the molecular weight decreases. The products obtained by the method of polymerization of the present invention are solid ethylene homo-polymers or the copolymers of ethylene and α -olefin, which have excellent bulk density and fluidity. Since the yields of polymer are sufficiently high, there is no need for the removal of catalyst residues. The present invention is further described by means of the examples and comparative examples as below but should not be confined or limited to these examples. Into a 1.0L reactor equipped with a mechanical stirrer, replaced with nitrogen atmosphere, 9.5 g of MgCl2 and 400 ml of decane were placed therein. After they were stirred at 300 rpm, 75 ml of 2-ethyl hexanol was added thereto. The temperature was raised to 120°C, and then the reaction was allowed to continue for three hours. The homogenous solution, which was obtained after the reaction, was cooled to room temperature (25 ° C). To the magnesium solution, cooled to room temperature as above, 1.4 ml of 2- hydroxyethyl methacrylate and 6.0 ml of silicone tetraethoxide were added, and then the reaction was allowed to continue for an hour. Into the above solution, a solution mixture of 50 ml of titanium tetrachloride and 50 ml of silicon tetrachloride was dripped thereto for one hour. After completing the dripping process, the temperature of the reactor was raised to 70°C and maintained at that temperature for one hour, followed by cooling to room temperature. After stirring, the supernatant of the solution was removed, and the rcmaining solid layer was continuously instilled with 200 ml of decane (A-l compound) and 100 ml of dethylaluminium chloride (1.0M; A-2 compound). There, the temperature was raised to 60 °C (A-3 temperature) and maintained thereat for two hours. After the reaction, after stirring, the supernatant of the solution was removed, and 600 ml of chloroform (CHC13; A-4 compound) was added thereto for reaction for one hour. Thereafter, it was cooled to room temperature, and after stirring, the supernatant of the solution was again removed, followed by washing twice with 600ml of decane. To this, 200ml of decane and 100ml of TiCLt were added, followed by raising the temperature to 100°C and maintaining thereat for two hours. After the reaction, it was cooled to room temperature and washed with 300ml of hexane until the removal of free unreacted TiCl The titanium content of the catalyst so produced was 6.8wt %. A 2-L high-pressure reactor was dried in an oven and assembled while hot. In order to make the inside of the reactor nitrogen atmosphere, nitrogen and vacuum were alternatively manipulated three times in the reactot. It was then instilled with 1,000 ml of n-hexane, after which 1 mmol of triethylaluminium and the above solid catalyst by 0.03 mmol in terms of titanium atoms were added thereto. Then, 2,000 ml of hydrogen was added. The temperature of the reactor was raised to 80 °C while stirring at 700 rpm. The pressure of ethylene was adjusted to 100 psi, and the polymerization was allowed to continue for an hour. After the polymerization, the temperature of the reactor was lowered to room temperature, and an excessive amount of ethanol solution was added to the polymerized matters. The polymer thus produced was collected by separation and was dried in an oven at 50 °C for at least six hours, whereby polyethylene was obtained in the form of white powder. 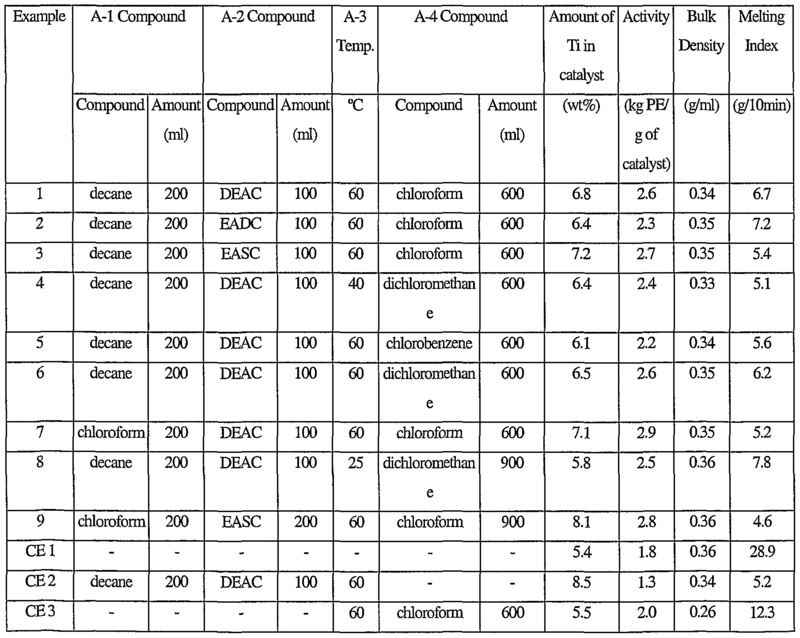 The precipitant was produced in the same manner as Steps (i) and (ii) of Example 1, and the catalyst was produced in the same method of Step (iii) while changing A-l, A-2 compounds, A-3 temperature and A-4 compound as shown in Table 1. The polymerization was carried out as in Example 1 , and the results thereof are shown in Table 1. The precipitant was respectively produced in the same manner as Steps (i) and (ii) of Example 1. After stirring, the supernatant of the solution was removed, and the remaining solid layer was washed twice with 600ml decane. To this, 200ml of decane and 100ml of TiCU were added, followed by raising the temperature to 100 °C and maintaining thereat for two hours. After the reaction, it was cooled to room temperature and washed with 300ml of hexane until the removal of free unreacted TiCU- The titanium content of the catalyst so produced was 5.4wt %. The polymerization was carried out as in Example 1, and the results thereof are shown in Table 1. The precipitant was respectively produced in the same manner as Steps (i) and (ii) of Example 1. After stirring, the supernatant of the solution was removed, and the remaining solid layer was continuously instilled with 200 ml of decane and 100 ml of diethylaluminium chloride (1.0M). There, the temperature was raised to 60°C (A-3 temperature) and maintained thereat for two hours. After the reaction, after stirring, the supernatant of the solution was removed, and it was twice washed with 600 ml of decane. To this, 200ml of decane and 100ml of TiCU were added, followed by raising the temperature to 100°C and maintaining thereat for two hours. After the reaction, it was cooled to room temperature and washed with 300ml of hexane until the removal of free unreacted TiCU- The titanium content of the catalyst so produced was 8.5wt %. The polymerization was carried out as in Example 1, and the results thereof are shown in Table 1. Example 1. After stirring, the supernatant of the solution was removed, and the remaining solid layer was continuously instilled with 600 ml of chloroform (CHC13), followed by raising the temperature to 60°C for reaction for one hour. Thereafter, it was cooled to room temperature, and after stirring, the supernatant of the solution was again removed, followed by washing twice with 600ml of decane. To this, 200ml of decane and 100ml of TiCU were added, followed by raising the temperature to 100 °C and maintaining thereat for two hours. After the reaction, it was cooled to room temperature and washed with 300ml of hexane until the removal of free unreacted TiCU- The titanium content of the catalyst so produced was 5.5wt %. The polymerization was carried out as in Example 1, and the results thereof are shown in Table 1. * DEAC: diethylaluminium chloride, EADC: ethylaluminium chloride, EASC: ethylaluminium sesquichloάde, CE: comparative example. As shown above, by way of the production process according to the present invention, it is possible to produce a new catalyst of high polymerization activity for homo- and co- polymerization of ethylene, which can produce polymers of high bulk density. (iϋ) reacting said solid component with an aluminium compound and a haloalkane compound, and then reacting thereto a titanium compound. 2. The method for producing a catalyst for homo- or co-polymerization of ethylene according to Claim 1, wherein said ester compound containing at least one hydroxy group is an unsaturated aliphatic acid ester having at least one hydroxy group, which is selected from the group consisting of 2-hydroxy ethylacrylate, 2-hydroxy ethylmethacrylate, 2-hydroxy propyl acrylate, 2-hydroxy propylmethacrylate, 4-hydroxy butylacrylate, andpentaerythritol tri-acrylate; an aliphatic monoester or polyester containing at least one hydroxy group, which is selected from the group consisting of 2-hydroxy ethyl acetate, methyl 3-hydroxy butylate, ethyl 3-hydroxy butylate, methyl 2-hydroxy isobutylate, ethyl 2-hydroxy isobutylate, methyl-3-hydroxy-2-methyl propionate, 2,2-dimethyl-3-hydroxy propionate, ethyl-6-hydroxy hexanoate, t-butyl-2-hydroxy isobutylate, diethyl-3-hydroxy glutarate, ethyl-lactate, isopropyl lactate, butyl isobutyl lactate, isobutyl lactate, ethyl mandelate, dimethyl ethyl tartrate, ethyl tartrate, dibutyl tartrate, diethyl citrate, tiiethyl citrate, ethyl-2- hydroxy-caproate, and diethyl bώ-(hydroxymethyl) malonate; an aromatic ester having at least one hydroxy group, which is selected from the group consisting of 2-hydroxy ethyl benzoate, 2-hydroxy ethyl salicylate, methyl-4-(hydroxy methyl) benzoate, methyl-4- hydroxy benzoate, ethyl-3-hydroxy benzoate, 4-methyl salicylate, ethyl salicylate, phenyl salicylate, propyl-4-hydroxy benzoate, phenyl 3-hydroxy naphthanoate, monoethylene glycol monobenzoate, diethylene glycol benzoate, and tiiethylene glycol monobenzoate; or an alicyclic ester having at least one hydroxy group such as hydroxy butyl lactone; and wherein said silicon compound having at least one alkoxy group is represented by a general formula of RnSi(OR)4.n, where R stands for a hydrocarbon having 1-12 carbons; and n for a natural number of 0- 3. 3. The method for producing a catalyst for homo- or co-polymerization of ethylene according to Claim 1, wherein said titanium compound is represented by a general formula of Ti(OR)aX4-a, where R stands for an alkyl group having 1-10 carbons, X for a halogen atom, and a for a natural number of 0 - 4; and wherein said silicon compound is represented by a general formula of RnSiCU-n, where R for an alkyl group having 1-10 carbons; and n for a natural number of 0 - 4. 4. The method for producing a catalyst for homo- or co-polymerization of ethylene according to Claim 3, wherein said titanium compound is a 4-halogenated titanium, which is selected from the group consisting of TiCU, TiBr4, and TiU; a 3-halogenated alkoxytitanium, which is selected from the group consisting of Ti(OCH3)Cl3, Ti(OC2H5)Cl3, Ti(OC2H5)Br3, and Ti(O(i-C H9))Br3; a 2-halogenated alkoxytitanium, which is selected from the group consisting of Ti(OCH3)2Cl2, Ti(OC2H5)2Cl2, Ti(O(i-C4H9))2Cl2, and Ti(OC2H5)2Br2; and a tetralkoxytitanium, which is selected from the group consisting of Ti(OCH3)4, Ti(OC2H5)4, and Ti(OG}H9)4; or mixtures thereof; and wherein said silicon compound is silicon tetrachloride, a trichlorosilane, which is selected from the group consisting of methyltrichlorosilane, ethyltrichlorosilane, and phenyl-trichlorosilane; a dichlorosilane, which is selected from the group consisting of dimethyldichlorosilane, diethyldichlorosilane, diphenyldichlorosilane, and methylphenyldichlorosilane; or a monochlorosilane such as trimethylchlorosilane; or mixtures thereof. 5. The method for producing a catalyst for homo- or co-polymerization of ethylene according to Claim 1, wherein said titanium compound is titanium tetrachloride, and said silicon compound is silicon tetrachloride. 6. The method for producing a catalyst for homo- or co-polymerization of ethylene according to Claim 1, wherein the amount of mixture of said titanium compound and said silicon compound is 0.1~200mol per one mole of said magnesium compound; and the ratio of mixture of said titanium compound and said silicon compound in molar ratio is 1:0.05-0.95. 7. The method for producing a catalyst for homo- or co-polymerization of ethylene according to Claim 1, wherein aluminium compound is a trialkyl aluminium having an alkyl group of 1 - 6 carbons, which is selected from the group consisting of triethylaluminium and triisobutylaluminium; an aluminium compound having one or more halogens, which is selected from the group consisting of ethylaluminium dichloride, diethylaluminium chloride, and emylaluminium sesquichloάde; or the mixtures thereof. ITMI20120877A1 (en) * 2011-05-27 2012-11-28 Beijing Res Inst Of Chemi Cal Industry The adduct of magnesium halide, catalyst component / catalyst comprising adduct of magnesium halide and its preparation.